Since being drafted by the Los Angeles Kings in the fourth round of the 2009 NHL Draft, goaltender JF Berube has seen his stock quietly rise. This past season he posted some of the best numbers in the entire Quebec junior league – including 32 wins, a 2.60 goals-against average and a .902 save percentage. His team then swept their first round opponent in the playoffs, only to lose a tough second round series in six games. The highs and lows continued over the next few months for the 20-year-old netminder when soon thereafter he had minor surgery on his hip and later signed his first pro contract. Now, it appears a change in nickname may be in order for the man known as ‘Hollywood’ – a handle Kings goaltending coach Bill Ranford spoke about during Development Camp. With Jeff Zatkoff recently signing a one-year deal, he and Martin Jones will most likely be the goaltenders in Manchester again. 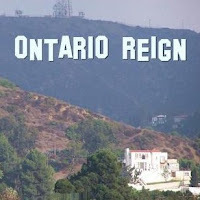 Leaving all signs pointing to Berube staring the year with the Ontario Reign, the Kings’ ECHL affiliate. However, Ranford wasn’t ready just yet to commit to such a plan. It just doesn’t have the same ring though, does it? For now, Berube is just happy people can’t call him ‘crutch’ anymore. He was able to put those away just prior to coming to Los Angeles for camp. Yet, he would have preferred to be on the ice showing the coaches how he’s grown over the last year. “It’s too bad that I can’t go out on the ice right now, as they haven’t seen me a lot this year,” he shared. Which is something that could be said about his game and his injury. The hip situation is expected to be fully healed next month. So, he should be good-to-go come Rookie Camp. What’s next then? “I feel like I’m ready to move up to the pro level,” stated Berube. Which brings us back to Ontario. No, some football guy already used that one. Back to the drawing board for Hollywood. Like his mask design, maybe he’ll have a new nickname picked out come camp in September.